How do I extract this field from my sample Meraki Flow syslog events to use in search? I am having trouble using a field that is in my log entries, but Splunk doesn't "auto-discover" it when I started indexing data. I have played around with using the "extract new fields", but can't get the field to work right. The field name is "pattern:" in the log entries. I would like to be able to search based on the value of "pattern:" in the entries. I believe the only values it can have in the logs are: 0, 1, allow all. As you can see the pattern: field can have text or a numeric value if that helps narrow down the issue. Any help would be greatly appreciated. I am new to Splunk and have looked around, but I might not even know the terminology to use to search properly. 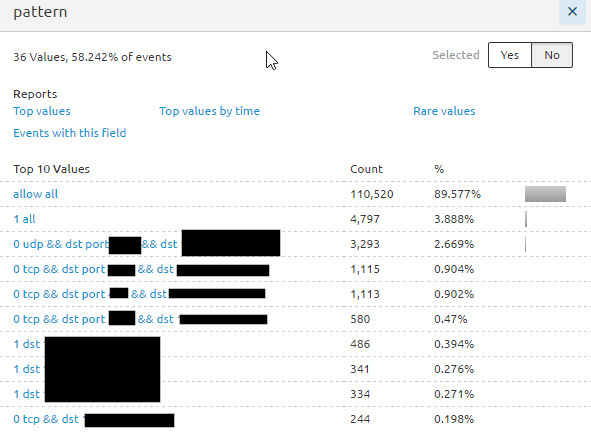 Splunk will auto-discover fields in the name=value pattern, which most of your event uses. 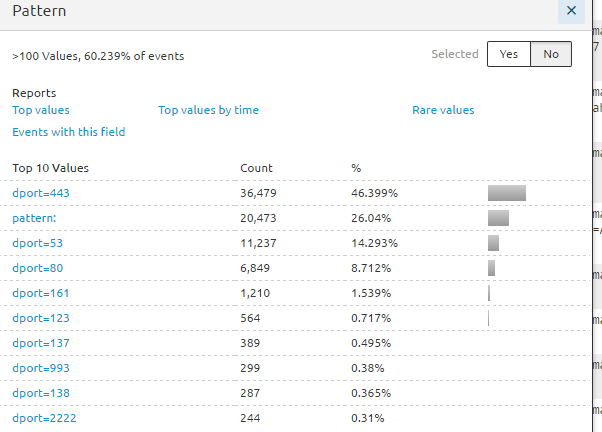 The 'pattern' field is different, which is why Splunk is not discovering it. Do you have the ability to change the logging? Rich, yes the other fields are being picked up fine. Unfortunately for this case, Meraki does not allow changing the output of the log entries. Not sure why they decided to have that one field formatted differently. Yes that worked! I added your code to my field extraction and it looks like it is picking it up correctly now! Thanks for the help. Consider this REGEX as a starting place for a parser for your events. Your base search | rex "pattern: (?<pattern>(\d+|\w+\s*\w+|\w+))"
Thanks for the input but I think I have my question answered above. simply rexing out the field you need will work for you.You will have to just rex out your field from the field. Is there a syntax error in my search to extract a field from the source field? Why does my rex search with a regex only match a few of the results even with max_match? How to edit my regular expression to extract these fields from my sample data using rex? How to extract from a value from XML and include it in the search?